The first two semifinals didn’t give me much to work with, but I’m standing at the whiteboard tonight. Not much of an improvement, but I do get to give out colors! Cathy was very aggressive with her two Daily Double wagers, putting up 4,000 and 5,000. The miss on the latter might be coming back to bite her. 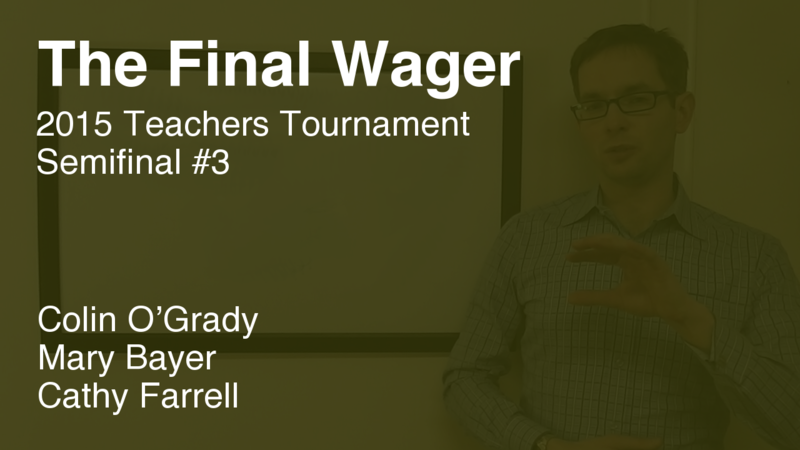 Colin was our highest-scoring quarterfinalist; Mary and Cathy were wild cards #3 and #4. Strange how things flipped around tonight. I haven’t advertised it yet, but I put up this week’s Fact Primer early: how to memorize the countries of Asia. Go check it out and see if it works for you. 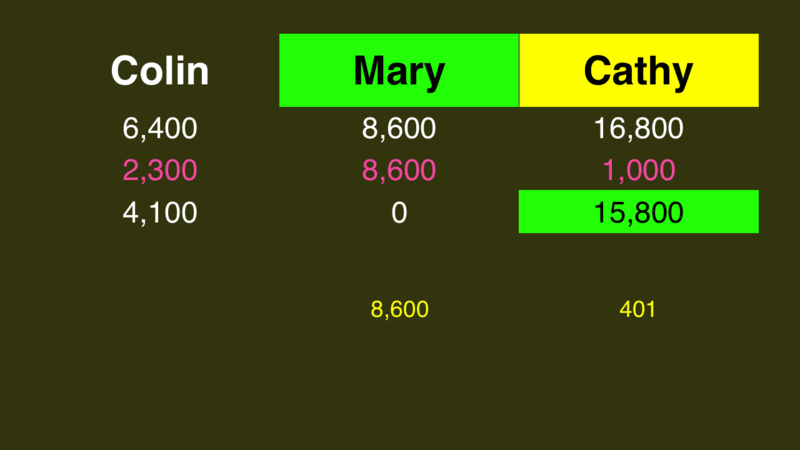 Not much to calculate here: Mary should wager everything, and Cathy should put up 401. So now the Finals are set. 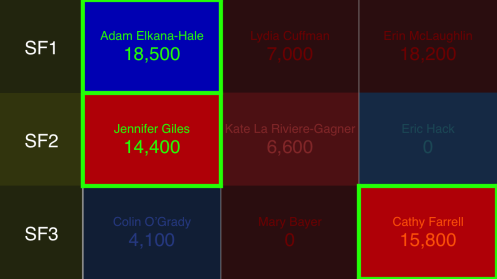 Adam Elkana-Hale, our lone remaining beard, will take the first podium; Cathy will be in the middle, and Jennifer Giles will be closest to the audience. Would Colin have gone small here and taken the match? He’ll have to get back to us. You’re exactly right: I figured that we have given you nothing to work with for eight days, so a hypothetical was better than nothing! 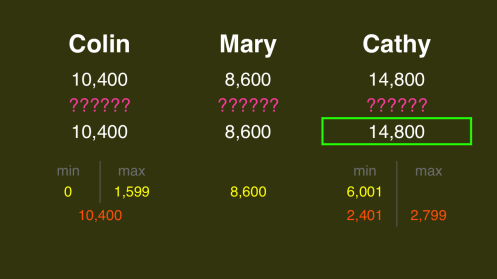 I did the math sometime in the middle of the Sculpture category–where I was utterly out of my depth–and figured that if I could get a couple more clues, both Mary and I would be within touching distance of Cathy, forcing her to bet biggish to cover a potential double bet. I also knew that Final had been trending towards misses all tournament long (I was in the first QF and had the advantage of seeing every single game), so the odds of a Triple Stumper were reasonable. My plan was to get close enough, zero bet, and hope to be the last one standing. By the time we got to the last clue, I knew that the status quo was not good enough, so I buzzed in and guessed. Really, this is my way of saying thank you; I was able to make these split-second in-game decisions about strategy because of all of the time I spent studying TFW. I’m clearly not a math person, but I was able to make sense of all of this and go in knowing how to make adjustments. It didn’t quite pan out, but I was one clue away from wagering myself into the final (which I had no place being in) on the back of your assistance.